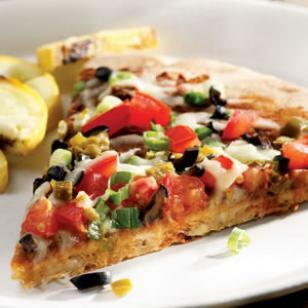 This pie is an over-the-top, vegetarian concoction with black-bean spread, Jack cheese, tomatoes, scallions, olives and pickled jalapenos; it's part nacho, part pizza. For an even more decadent treat, serve with low-fat sour cream. Without sour cream - a serving is only 317 calories of deliciousness. To prepare dough: Stir water, yeast, sugar and salt in a large bowl; let stand until the yeast has dissolved, about 5 minutes. Stir in whole-wheat flour, bread flour (or all-purpose flour) and cornmeal until the dough begins to come together. When you’re ready to make your pizza, turn the dough out onto a lightly floured surface. Dust the top with flour; dimple with your fingertips to shape into a thick, flattened circle—don’t worry if it’s not perfectly symmetrical. Then use a rolling pin to roll into a circle about 14 inches in diameter. To prepare topping & assemble pizza: Place beans, peppers, garlic, chili powder and salt in a food processor and process until smooth, scraping down the sides as needed. Using a large spatula, flip the crust. Spread the bean mixture on the crust, leaving a 1-inch border. Quickly layer on cheese, tomatoes, scallions, olives and pickled jalapeños. Tip: To roll out pizza dough: When you're ready to get your pizzas on the grill, turn the dough out onto a lightly floured surface. Dust the top with flour; dimple with your fingertips to shape into a thick, flattened circle—don't worry if it's not perfectly symmetrical. Then use a rolling pin to roll into a circle about 14 inches in diameter.